When I came on deck at 11 p.m. it was still light out. The spinnaker was drawing nicely and we were galloping westward at a cool 7 knots across the vast Gulf of Alaska. After completing all my typical ondeck checks and recording an entry in the log, I settled in to watch the miles tick by. From my seat on the port side of the cockpit, a black-footed albatross caught my eye and I followed it while it made several passes to starboard—dipping towards the wave tops, rising up smoothly and then sailing on ahead before looping around the boat again. Pure, graceful beauty. 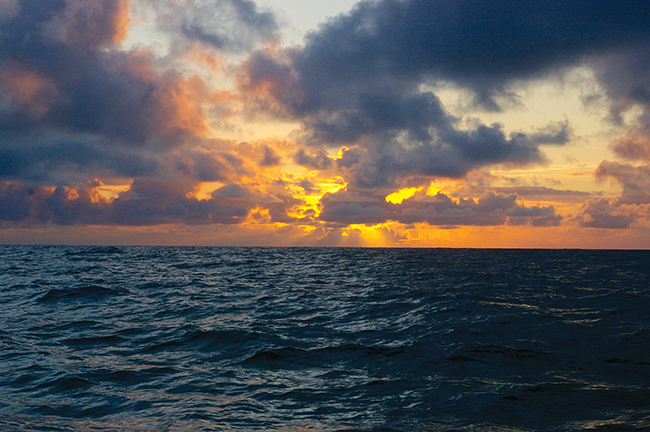 This was night three of a 500-mile non-stop jaunt across this notoriously rough body of water and at this point, my body had adjusted to the schedule and rhythms of being at sea. Sleep was coming regularly while I was off watch, meals were going down the hatch with little effort and keeping the crew (a two-year-old and four-year-old) content was going well for Jill and me. As often happens to sailors during a night watch, my mind slowly turned from the movement of the boat, sail trim, heading and crew comfort to more existential matters. In particular, I got thinking about how time moves during a passage or while hopping from one anchorage to another in an idyllic archipelago. It’s an existence truly like no other lifestyle. The concept of time while sailing offshore or cruising coastaly takes on two distinct yet different incarnations, and we find ourselves shifting between them seamlessly. In many ways, sailors are bound by time and live a routine that has us depending on it. The seasons dictate where we go. Exact watch schedules must be adhered to in order to make a passage efficient for all aboard. Logs must be up-to-date. Changes in tides and currents happen at predictable times that can either help or hinder a boat’s progress, or make certain harbor entrances or channels passable or not. The time of sunrise and set often signals the start and end of our days. And even seemingly small things like speed-time-distance calculations and engine hours have to be kept accurately. But in other ways, time is a far more fluid concept aboard a sailboat. While cruising, you have time to swing in a hammock and read a book or take a nap. Work on hobbies and boat projects can happen off and on throughout a day, week or month. Time spent cooking and baking might take longer. And just sitting and enjoying a good conversation with crew or fellow cruisers might soak up the majority of an evening. Also, exploring new places on foot, kayak, dinghy or bicycle slows us down and puts us closer to the locales we’re discovering. Days at anchor can seem to meld together and an often heard sentiment from many cruisers is, “What day is it, anyway?” Most times it simply doesn’t matter. In some ways, time is up to us and in others, it’s up to forces beyond our control. Either way, it’s part of what makes this life challenging and rewarding at the same time. Andrew, along with wife Jill and sons Porter and Magnus, are currently cruising Alaska aboard their Grand Soleil 39 Yahtzee. Follow their adventures at threesheetsnw.com/yahtzee.